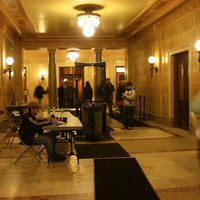 Metal detectors at Capitol entrance. 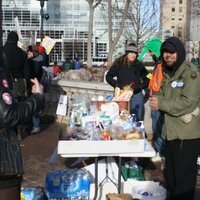 Protesters helping pass out donated food. 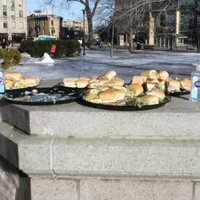 Sandwhich platters with a side of hand sanitizer. 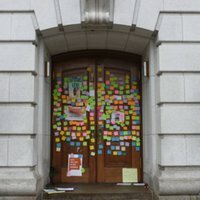 Post-it messages on the Capitol doors. Chalking the side walks with pro-union sentiment. 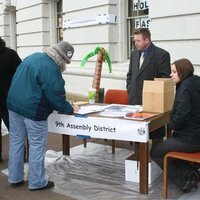 Representative Zamarripa (D-8) and Representative Zepnick (D-9) holding office hours outside admist security crackdowns inside the capitol. 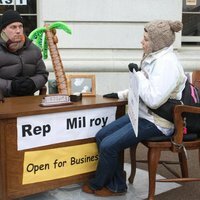 Representative Milroy (D-73) meeting with a constituent during outside office hours. 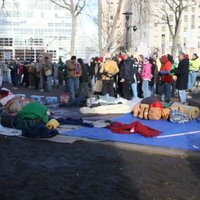 While the Walker Administration worked to limit public access to the Capitol, protesters refigured their usage of outside space in order to keep the Wisconsin Uprising alive.